We bring hope and compassion while expanding the possibilities of tumor treatment. The Montefiore Comprehensive Skull/Cranial Base Center is utilizing the most modern surgical approaches, from open to minimally invasive and endoscopic surgery, offered today. Deep-seated tumors that until recently were considered inoperable are now being removed while preserving normal function and optimizing our patients’ quality of life. We believe delicate procedures require a multidisciplinary team approach. Our specially trained and highly skilled neurosurgeons team up with head and neck surgeons, otolaryngologists, neuro-otologists, plastic surgeons, endocrinologists, neuro-ophthalmologists, radiation oncologists, medical oncologists and neuroradiologists to provide truly personalized care. Skull base tumors are complex and can involve multiple compartments in the skull. 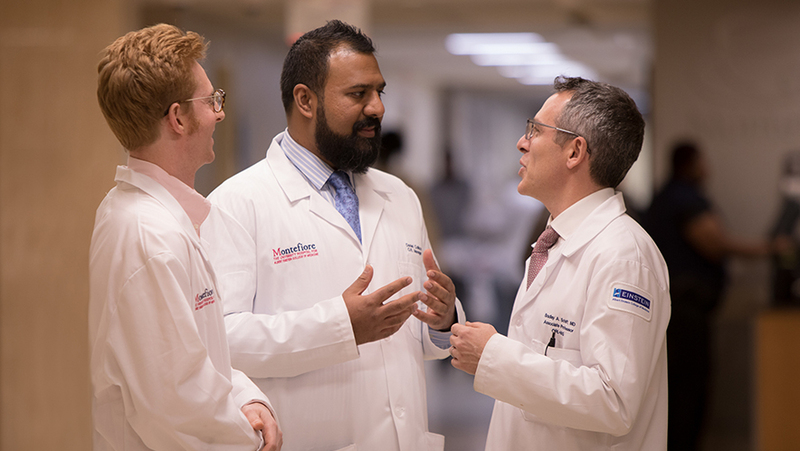 Montefiore’s cases are reviewed by and performed in collaboration with specialists in neurosurgery, otolaryngology (ear, nose and throat), radiation oncology and plastic surgery. The team at Montefiore’s Comprehensive Skull/Cranial Base Center uses the latest in cutting-edge technology, including high-powered illumination of tumors, real-time electrophysiologic monitoring of vital brain structures and stereotactic image guidance to help navigate the brain regions during surgery. 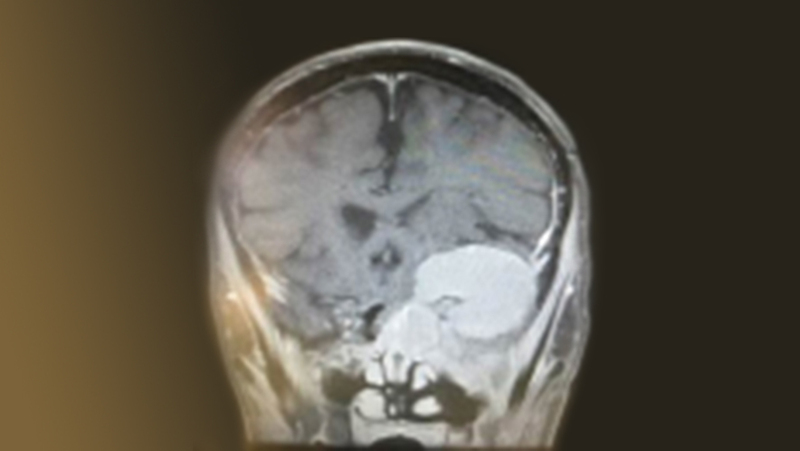 An MRI image shows a tumor in the brain extending beyond the skull, involving the sphenoid sinus and infratemporal fossa. Our center offers a complete array of the latest approaches and treatments, but we never forget that our main mission is to provide care. That means addressing the patient’s needs first, both inside and outside of the operating room. We are getting closer to the day when the word “inoperable” will no longer be part of a physician’s vocabulary. Our team is working toward that end. Our multidisciplinary team treats a vast spectrum of conditions, a selection of which you will find listed below. In addition to these, we have experience in treating many other conditions. Please contact us today to schedule a consultation so that we can review and discuss your specific healthcare needs. Treatment plans are designed to maximize our patients’ care, returning them to health as quickly as possible. For those seeking further information, we have included a few examples of the treatments we offer at the Comprehensive Skull/Cranial Base Center.